Thanks to the generous donations of supporters of the Physics Academy, we were able to purchase a new set of Arduino Uno micro-controllers for use in this year’s robotics competition. As I was planning out the unit on teaching DC circuits, I realized that some of our DC power supplies might need to be replaced. I got to thinking – could the Arduino replace these hulking, expensive power supplies? The answer has been (with one caveat) – yes. The above power supplies are nice, no doubt about it, but they are big, costly ($199) and they are not as nearly as extensible as a micro-controller. The Arduino micro-controller can act as a fixed 5V power supply, or using its PWM pins, you can vary the voltage from 0V to 5V with a resolution of about 20 mV. The other advantage about using the Arduino is that it gives you a chance to teach a little bit of programming too! In our case, it allows for a great introduction to robotics well before we are ready to start our unit on robotics. The one disadvantage is that you can’t test any circuits that need over 5V of electrical potential difference, nor can you test things like motors or other higher current (> 40 mA) circuits. We didn’t find this to be a big problem, but if you do, you can actually purchase a shield (an attachment that fits on top of the Arduino) from Adafruit Industries that allows you to use a higher voltage, higher current power supply that is controllable through the Arduino. One of the first activities that the students do, which is a great activity from the AMTA curriculum repository, is to have the students “map” the voltage between two metal bars that are partially submerged in water. 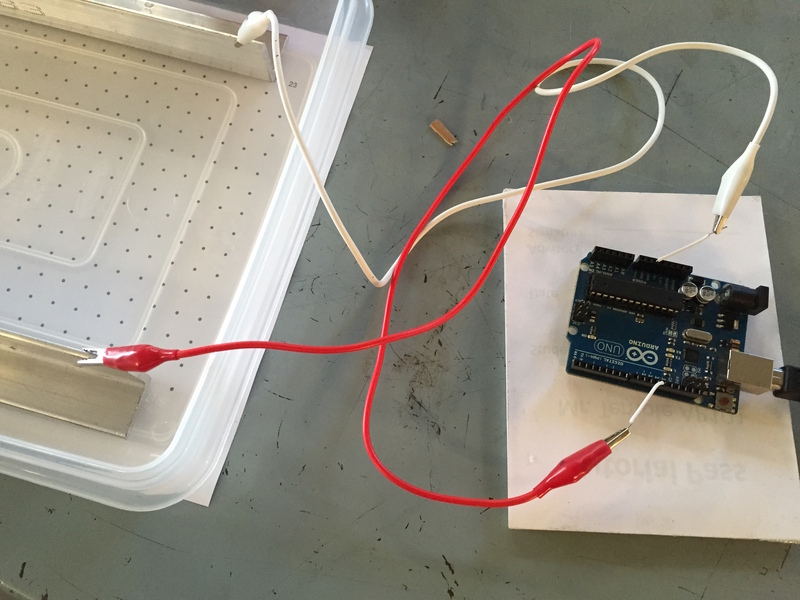 Using the Arduino as the power supply, the students use a multimeter to check the voltage at specific locations on a grid that is placed under the transparent pan holding the water. These numbers are recorded into a spreadsheet. Excel has a great tool for doing a 3D map of the values. What results is a really nice visualization of the potential isolines and the spacial variance of the voltage, and thus the electrical field. We then move from voltage maps to flow model. The students investigate how voltage, current and resistance are related to one another. The students begin by investigating the current flowing into and out of a resistor, and most are surprised to find that the current in the same flowing into a resistor as it is flowing out. They expect that current should be “used up” by the resistor – causing a bulb to glow for example. When they find that this is not the case, they either think that they have done the experiment incorrectly or that perhaps the multimeter is not precise enough. This confusion comes from the idea that they are expecting current and energy to be equivalent. The hydrology analogy is introduced as a possible model for describing this phenomenon. We discuss the movement of water past a water wheel, and how the water flowing into the wheel is equal to the amount of water flowing “out” from the wheel. Students quickly realize that the wheel still turns, not because the water is “used up”, but because the water looses energy. The final challenge for the students is to confront the oddity that is parallel circuits. This is made a bit easier by thinking about the flow model, but the confusion with parallel circuits stems from the idea that a battery is a constant current supplier – which of course it is not. The Arduino, just like a battery, will increase the amount of current flowing from its digital output pins when more pathways are added for the current to flow. This is where I would be careful to make sure however that you don’t approach the 40 mA limit. If you do, you can get some weird results in your observations as the Arduino will naturally cut off current draws around this range to protect its electronics. 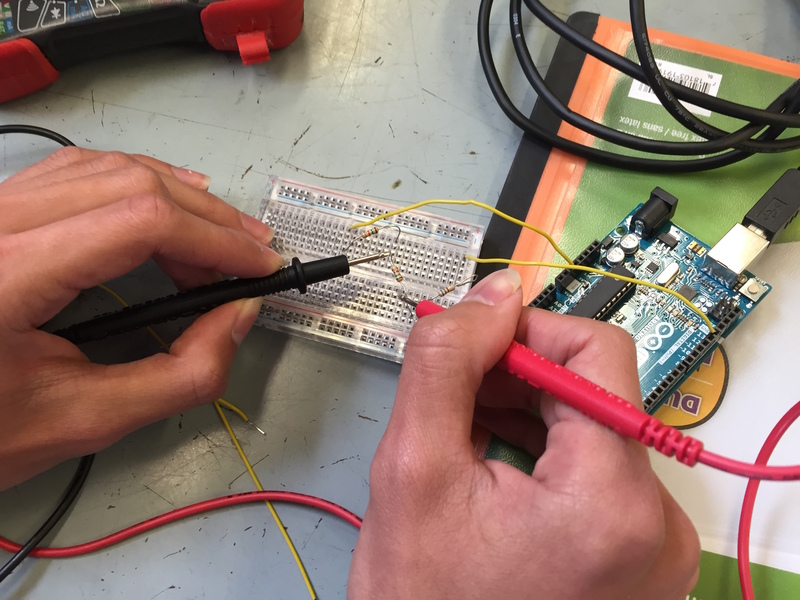 The switch to the Arduino has been quite successful, and as stated before, it launches the students into the robotics project with a knowledge that the Arduino is simply a controllable power supply. They learn very quickly from that point on that the Arduino can also act like a voltmeter too! Using its analog input and switching the digital pins to be input pins, the Arduino can also mimic the functionality of a multimeter. 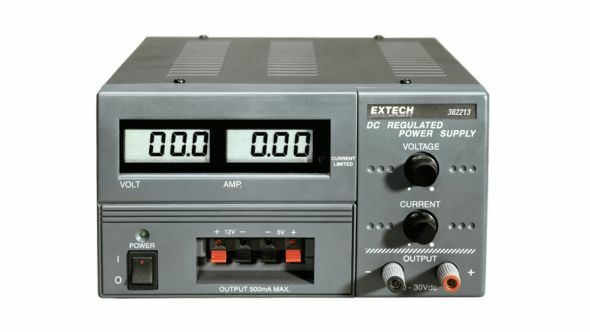 If you are considering new power supplies, I would recommend looking into this as an option. 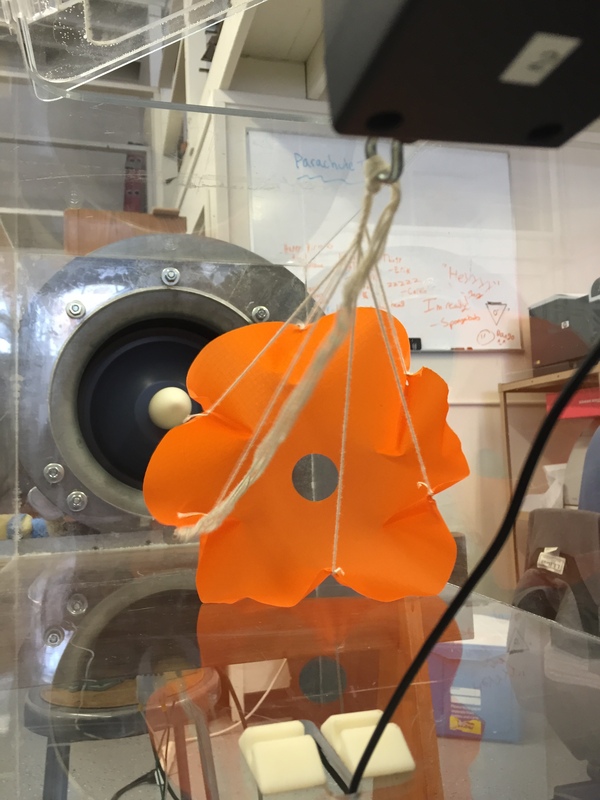 This entry was posted in APT Year Two, Engineering Instruction, Maker Space, News, Physics Modeling Instruction, Project Based Learning, Science, Teaching, Technology and tagged Academy of Physics and Technology, American Modeling Teachers Association, Engineering, investigation on April 25, 2015 by Steve Temple. The video above shows the recent deployment activity where students predicted the vertical position of a projectile (a Hot Wheels car) as it traversed a known horizontal distance. The student predictions are identified by green sticky notes on the the left hand side. The students first had to work out the problem on their own whiteboards before being given the sticky note that indicated the vertical position as measured above or below the red line. Most groups calculated the same position with two groups noting a sightly different prediction! In this deployment, I set up the ramp, and told them that they had a photogate sensor at their disposal. They had to design the experimental procedure. A great discussion followed, and the class was quite successful as you can see (the students who had the significantly different prediction were able to hunt down their mistake – so everyone felt that the model “worked”). Prior to the deployment, students were asked to use a video camera to record the motion of a projectile. This is a great experiment to do with LoggerPro or some other video analysis tools that allow the students to track the position of the ball or some other projectile. The students have also been learning how to simulate constant velocity and constant acceleration particle motion in Processing. We extended this to now include projectile motion, and the students analyzed simulated projectiles and compared the data gathered in the real universe to that gathered in the virtual universe. I will be writing about this process in more detail soon. This entry was posted in APT Year One, News, Physics Modeling Instruction, Science, Teaching and tagged Academy of Physics and Technology, American Modeling Teachers Association on March 29, 2015 by Steve Temple. We have just completed the second project in the Academy for the 2014-15 school year. It was a huge success! This project takes a classic physics project and “upgrades” it by incorporating modern engineering design technology and fabrication techniques. Its a great project with an incredible set of resources, background information, and step by step instructions. Unlike less rigorous and involved bridge design projects (using toothpicks for example), this project has the students building compression members (beams) and tension members (cords) and gussets to better model real world designs and to give the students the opportunity to learn and make decisions about which members to use in different parts of their own designs. 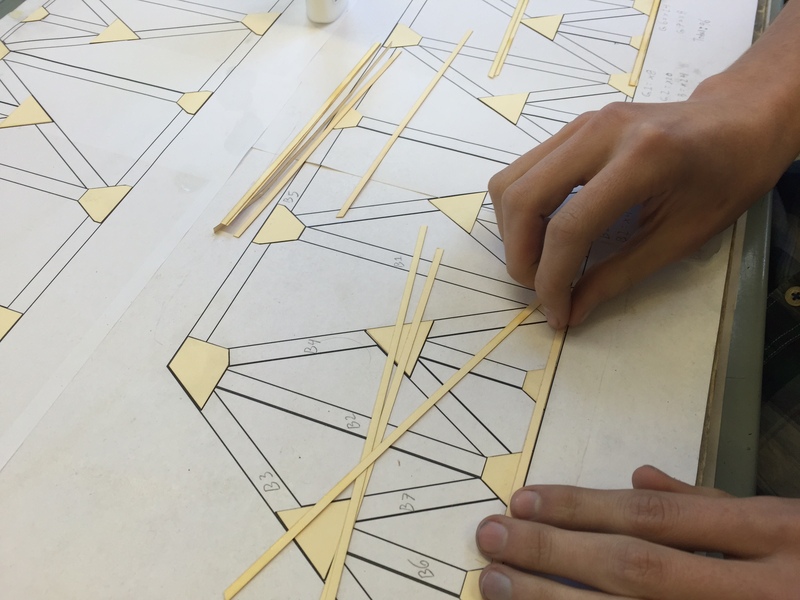 The only issue that we had with this project is that it requires the rather tedious process of having students trace out the unfolded beam designs onto file folder material and then use scissors and blades to cut out each beam and cord. But we have a laser cutter! 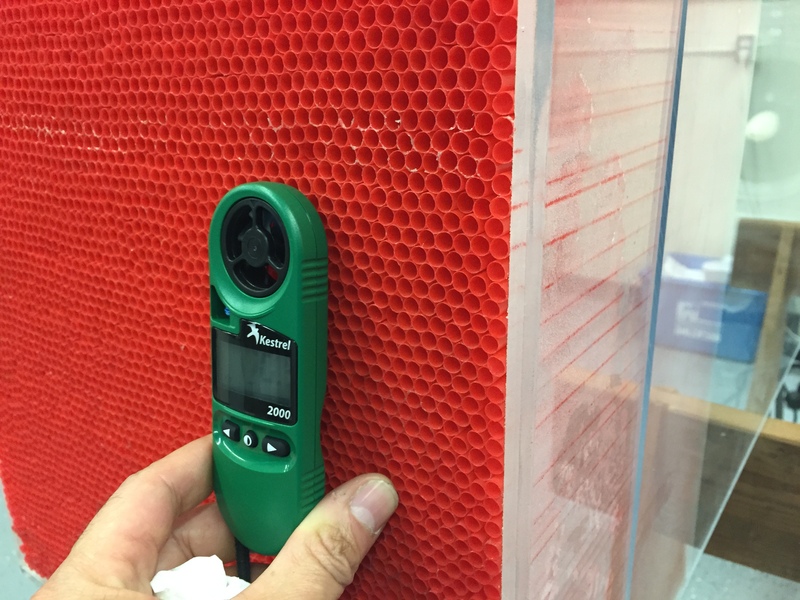 There had to be a way to incorporate both 3D CAD design and our laser cutter in order to modernize this process. We also knew that Autodesk Inventor had some really amazing tools for analyzing design structures. Autodesk Inventor has an amazing set of tools for designing sheet metal parts. Using these tools, an engineer can construct 3D models made of folded metal parts made from just about any thickness of metal stock. 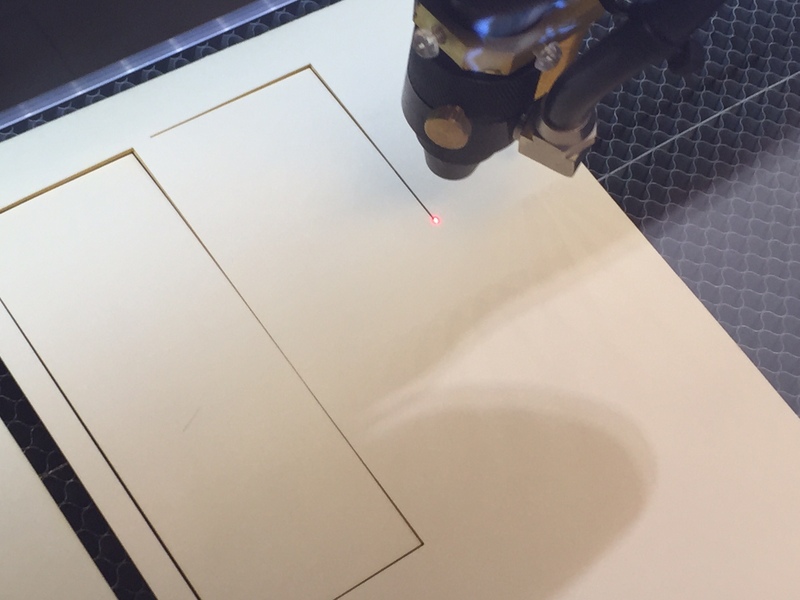 Once you have designed the folded metal part, Inventor will create a flat pattern design for you that you could then send to a CNC plasma cutter to cut from sheet metal stock. You would then fold the part up manually and you would have your folded part. Inventor gives you the ability to custom define the thickness of your stock, and some of the parameters around how it can be bent. We defined our stock to be as thick as manila folder paper. The next step is a bit tricky, but with the help of a great video I came across from Rob Cohee, we were able to define custom folded paper beam stock that the students could then use to build out their frames. Once again, Inventor has an amazing set of tools for defining structural frames (called The Frame Generator) that can then be populated with any kind of structural beam. You can also define your own structural beams that can be used to populate your frame. 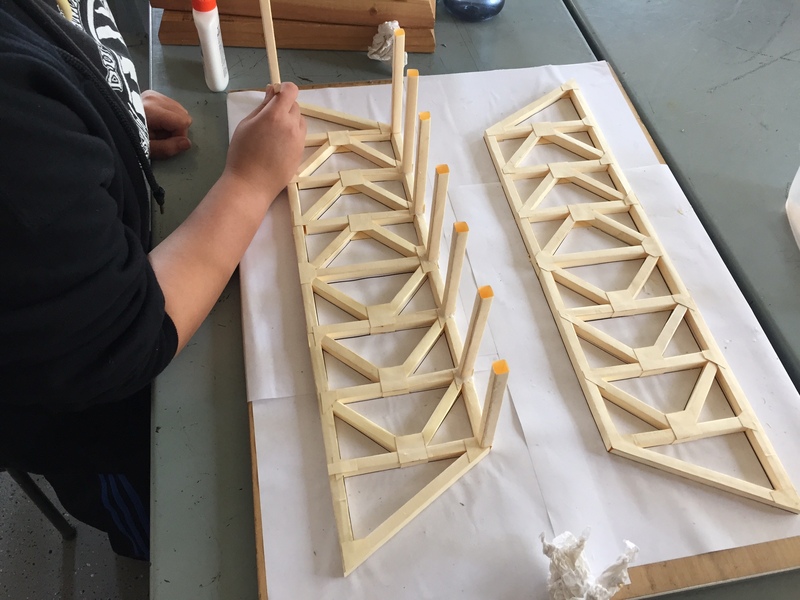 Once the students had designed the bridges, it was time to prepare the flat patterns and have the laser cutter do the work of cutting them out. 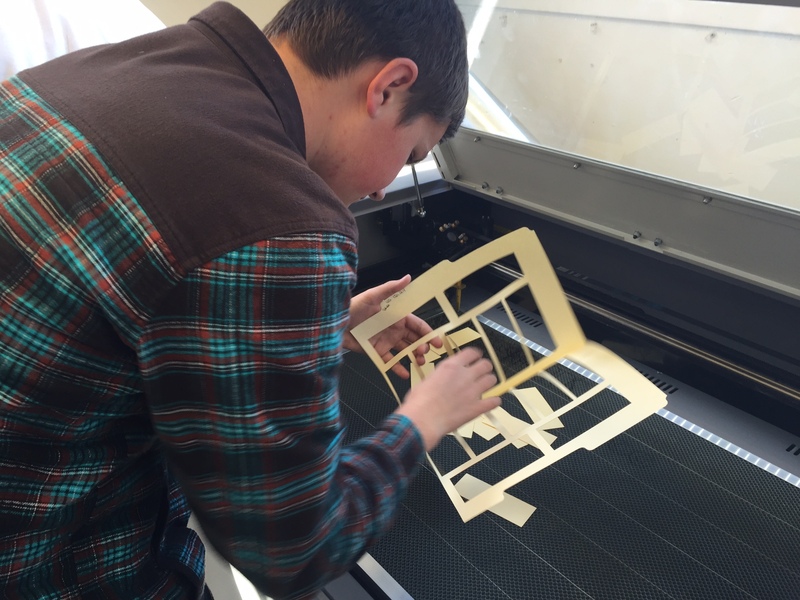 The students prepare their flat pattern cut-outs for the laser cutter and then you let the laser “rip”! Its awesome to sit back and watch this machine cut. I never get sick of watching it! Having the students do this would take SO much longer, the cut parts would be less accurate, and as all CTE teachers know, one of the most dangerous tools in the shop is an Exacto blade. This process goes relatively quickly as the students have done all the prep work to make sure that the pieces all fit together. Once again, this really demonstrates how modern technology can allow the students to focus their attention on design. Once the bridges are assembled, its time to test them out. The performance metrics for the contest are not actually based on the strongest bridge but rather a more realistic approach. We have attached a monetary value to each beam, gusset and cord. The bridges are then tested to a set value – the required load. The bridge that holds that load and is “manufactured” least amount of money is then given the highest marks. 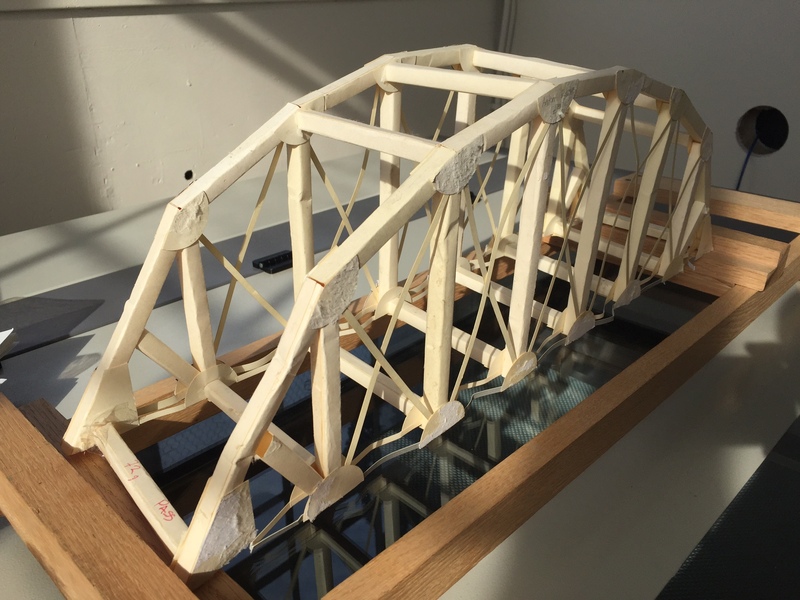 Once the bridge has been tested at the required load, we then give the students the choice to see just how much the bridges can hold before catastrophic failure. Most students (encouraged by both peers and staff!) decide to take their bridge to the limit. Its always a fun way to end the project! This entry was posted in APT Year One, Bridge Project, Engineering Instruction, Laser Cutter, Maker Space, Making, News, Project Based Learning, Science, Teaching, Technology and tagged 3D CAD, Academy of Physics and Technology, Advanced Fabrication, Autodesk, Autodesk Inventor, CNC, Engineering, Fabrication, Frame Generator, Laser Cutting, Net Force Particle Model, Physics Modeling Instruction, Science Education on March 21, 2015 by Steve Temple. This was my first attempt at doing just this, and I had some success and realized that I have some work to do. Because its built on a visual programming interface, its really easy for the students to create visual content on the screen, and it is very easy to create visual animations due to the embedded “draw” loop. The official website has great examples and tutorials. It is full of great code samples and quick tutorials. You can loose yourself for hours (or days!) just having fun exploring the examples and tutorials. 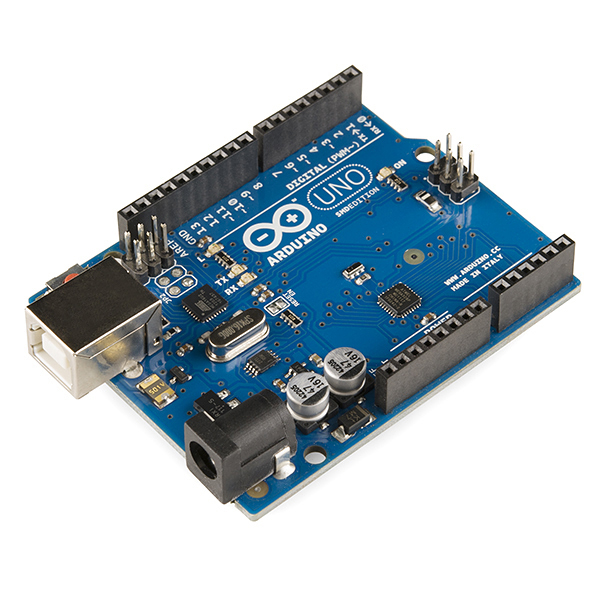 The IDE is simple and very similar to the Arduino IDE, so if you plan on doing any Arduino programming, the similarity is nice for the students. Its object oriented so that you can have the added benefit of teaching important programming concepts – though this might be why some people might not like it. The simulation that the students were introduced to was a simulation that modeled Newton’s Law of Universal Gravitation. The students were given some instructions on the basic structure of the program, and I made sure that there was some guiding comments embedded in the code. This program was inspired/adapted from a similar program created by Daniel Shiffman who has also written an amazing book on simulating nature through code called Nature of Code. // Newton’s second law at its simplest. This class defines an object that behaves like a planet. also can attract other planet objects. // This function allows a planet to exert an attractive force on another planet. // This is where we use Newton's Law of Universal Gravitation! // Return the force so that it can be applied! // This is where you can change the initial velocities of the planets. // Now apply that force on the other planet. // Allow the planets to now move. There is some slightly complicated code that controls the direction of the force and how that force is then applied to the planet object’s state of motion, but I didn’t have the time to explain this, which was a bit disappointing (see below). In an already full introductory physics curriculum, there is little or no time to teach major programming skills. Students who are new to programming are also new to the process of debugging; teaching debugging strategies requires even more time…Working on programming activities only once a week in a lab or recitation section may not be adequate to keep knowledge of syntax and program structure fresh in the students’ minds. I plan on taking some time this summer to see how I could integrate computer programming more significantly into the curriculum without causing the learning of Physics to suffer – that would of course defeat the purpose! This entry was posted in APT Year Two, Engineering Instruction, News, Physics Modeling Instruction, Science, Teaching, Technology and tagged Academy of Physics and Technology, American Modeling Teachers Association, computer simulation, gravity, investigation, Newton's Universal Law of Gravity, Physics Modeling Instruction, processing, Science Education on January 28, 2015 by Steve Temple. You might be one of the many Americans that are a bit perplexed by this whole new Common Core State Standards (CCSS) “stuff”. In this post I will try my best to explain how I designed an assessment for the first year students in the Academy that aligns with the Common Core. This was partly motivated by a district wide push to bring all curriculum in alignment with the CCSS, specifically as it relates to literacy. For context, I will identify the educational goal that in part motivated this effort. Our school site administration has identified argumentation as a key curricular focus that all staff will address this year. This has given the school the ability to focus on literacy and has allowed the school staff to guide their efforts towards a collaborative goal. This assessment was organized into three parts: the prediction, the analysis, and the reflection. Each part of the assessment focused on specific standards. If you haven’t had a chance to read a previous post where I describe how the students conducted experiments and collected data pertaining to building a predictive model, then I might suggest it, as it is really the first part of this assessment. Force diagrams (free-body diagrams) depicting the predicted forces acting on the rocket during the a) thrust phase, b) cruise phase, and c) descent phase. Net force equations that identify the causal relationship governing the motion state of the rocket. Three motion graphs depicting the predicted behavior of the rocket. This included its predicted acceleration, velocity and position as a function of time. The student teams submitted these reports prior to the actual launch. The next step was to run the actual experiment – the launching of the rockets! 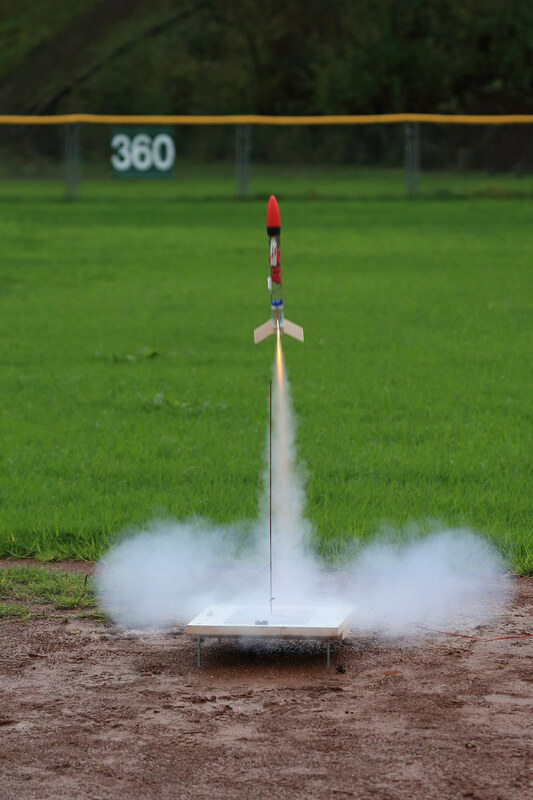 Although the launch day was soggy, we still had a successful afternoon, and we got some great data. The details of the launch are described in a previous post. A velocity vs time graph from the information above. 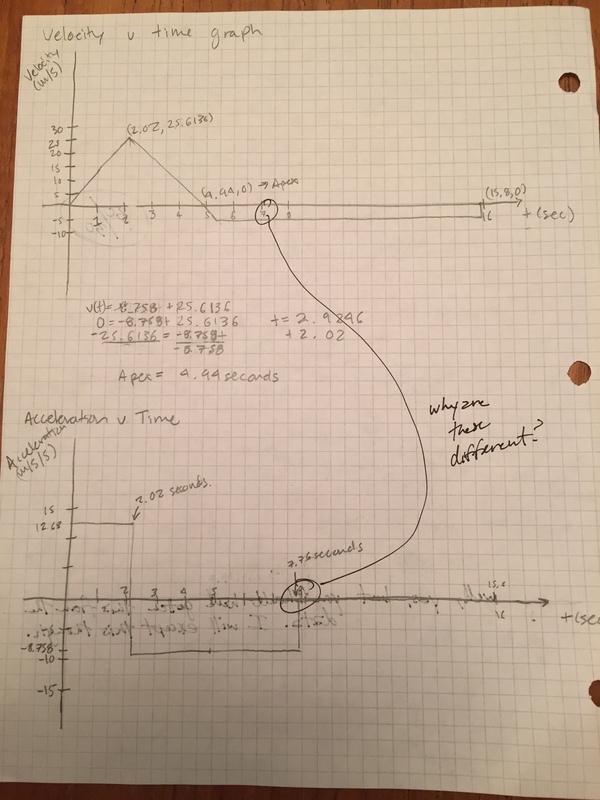 An acceleration vs time graph. The final part of the assessment asked the students to compare the prediction and analysis reports and then propose reasons for discrepancies between the data. I also asked the students to respond to some Aristotelian counter claims by using their data and the models that we had collectively established in class. I asked the students to respond to the following questions which required that the students use data to support their analysis. Compare the predicted NET force on your rocket during the thrust phase to the actual NET force on your rocket during the thrust phase by using your data – you will need to estimate the actual NET force during this phase. Using these numbers as evidence (you must include these values in your answer), describe at least one reason these values are different. Compare the predicted maximum height of your rocket with the actual maximum by using your data. Using these numbers as evidence (you must include these values in your answer), describe at least one reason these values are different. 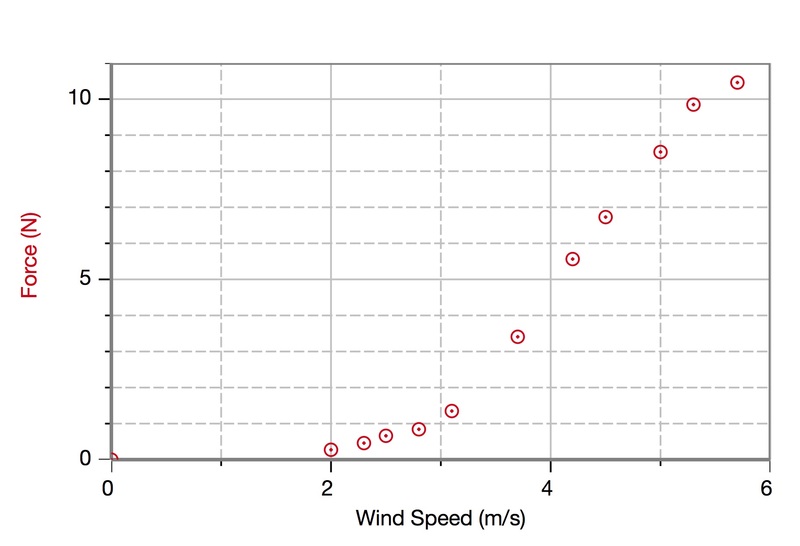 Compare the predicted descent velocity during the descent phase to the actual descent velocity from your data. Using these numbers as evidence (you must include these values in your answer), describe at least one reason these values are different. Look at your data and then also at your prediction graphs. Describe at least two differences between the graphs, AND WHY you think these differences exist. Based on the actual data you collected, what design changes would you make IF you could create this rocket from scratch again? Give at least two examples of design changes you would make. I am very pleased by the students’ performances on this assessment, and many of the students enjoyed the process and appreciated the opportunity to connect their learning and demonstrate their knowledge and skill. I feel that there is much to consider for the next time I do this kind of assessment, which will be at the end of the spring semester. One area I can quickly see I need to help the students develop is making connections to data more explicit. Most students would justify their arguments by stating that a certain explanation was evident. I need to help them develop the skill of presenting evidence more clearly and then linking their arguments to the actual evidence. This was an implicit practice, but it needs to be more explicit. I hope to hear from you all about how I might perfect this process, and prepare the students to excel on this kind of authentic, problem based assessment. This entry was posted in APT Year One, Engineering Instruction, News, Physics Modeling Instruction, Project Based Learning, Rocket Project, Science, Teaching on January 11, 2015 by Steve Temple. 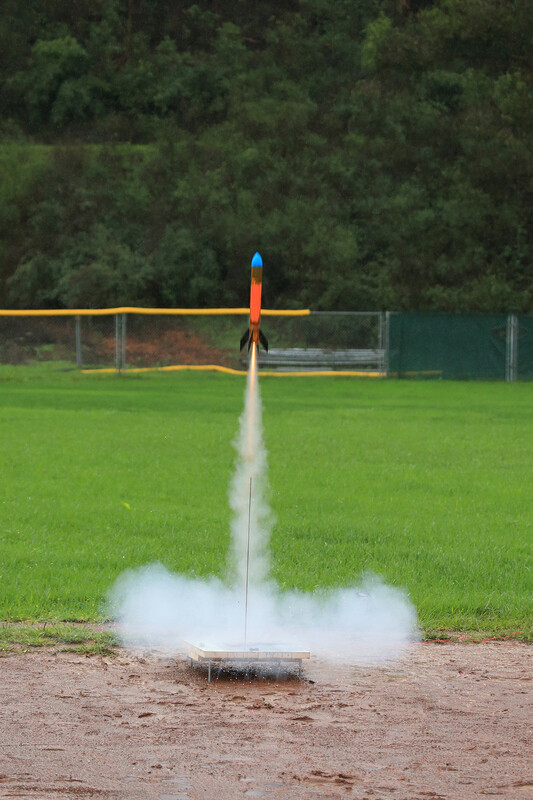 This is a follow up post to Modeling A Rocket’s Journey – A Synthesis where I described how the students in the first year program were engaged in creating a predictive report for their model rockets. I want to emphasize that these model rockets were not kits. Each rocket was designed using 3D CAD software, and each component was either fabricated from raw material, or was created from material that was not intended for use in model rocketry. The only exception to this is the actual rocket motor. The next step was to launch the rockets and have the altimeter payload collect altitude data. Unfortunately the week of our scheduled launch happened to be a week of some pretty hefty rains. We rescheduled the launch twice before finally accepting the soggy launch conditions. With umbrellas and rain jackets, we trudged out to the baseball diamond and got to work setting up for the launch. 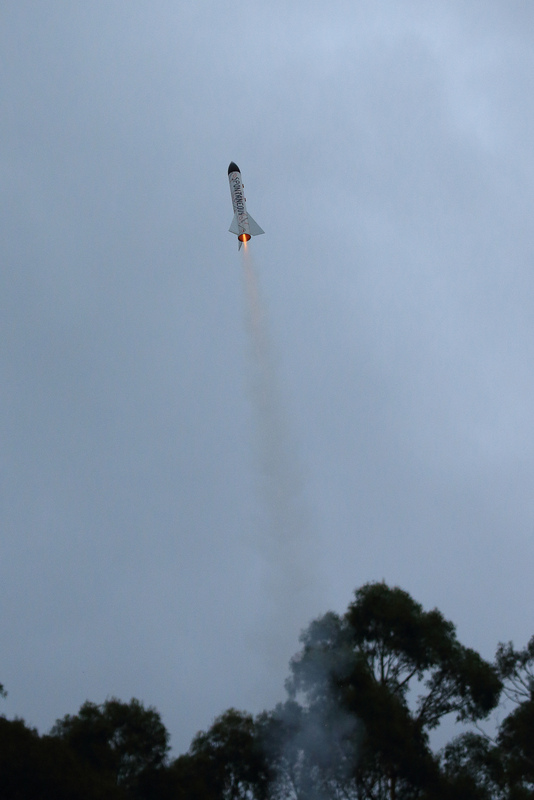 We had some minor difficulties in the wet weather, but eventually had a very successful launch day. 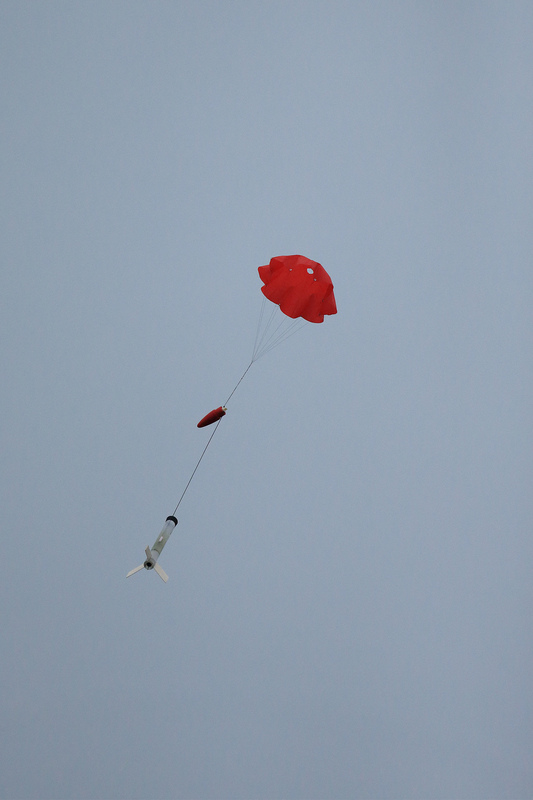 Most of the rockets were able to launch and deploy their valuable payload – the Pnut Altimeter. The students seemed very excited to finally see the rockets launch, and to see the successful deployment of the parachutes. Although we all got a little wet and muddy, we had a great time! The students were then asked to use the data to create a comparative analysis report. I will detail how the assignment was set up and also discuss how the students performed on this assignment. That will be for another post. I want to also thank Mr. Kainz for his amazing photos that are displayed here. This entry was posted in APT Year One, Engineering Instruction, Laser Cutter, Maker Space, Making, News, Physics Modeling Instruction, Project Based Learning, Rocket Project, Teaching, Technology and tagged 3d printing, Academy of Physics and Technology, Advanced Fabrication, American Modeling Teachers Association, constant acceleration particle model, Constant Velocity Particle Model, Laser Cutting, model rockets, Net Force Particle Model, Physics Modeling Instruction, Rocketry, Science Education on January 3, 2015 by Steve Temple. In this post I will describe a culminating activity for the first year students in the Academy. This is really the destination that the students have been headed towards since the beginning of the course. Everything they have learned is synthesized in this activity where the students gather data from various observations/experiments and then use the data to predict their own model rocket’s journey. Although the students had not been introduced to the concept of Impulse-Momentum transfer, we can use the average force, and that seems to work out really well. 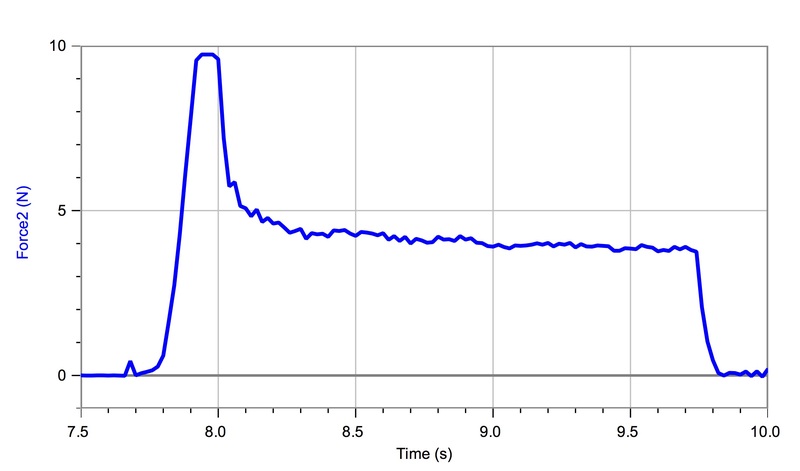 Just to make sure we could do this, I used the Integral tool in LoggerPro to measure the impulse, and it came out to 8.83 N s – really close to what Estes states – 8.8 N s.
Students were able to increase the air speed in the tunnel by turning a rheostat that controlled the fan speed. They then measured the wind velocity and graphed that against the measured force – just like NASA! Here is some sample data to show how the results came out – not bad! 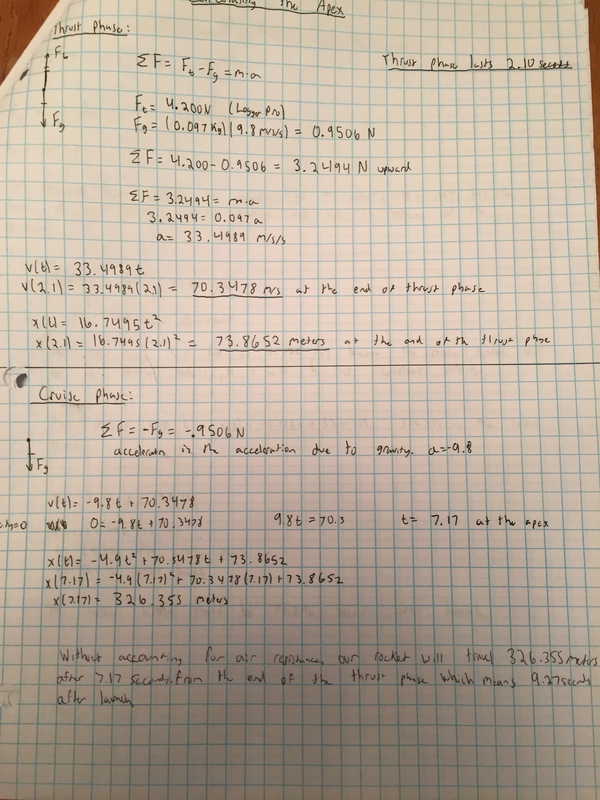 Students now had a way to estimate the descent velocity because they could calculate the gravitational force on their rocket, using the measured mass of their rockets, and then they could use their data to find the corresponding wind speed. A set of force diagrams for the different phases – thrust, cruise, and descent. The diagrams also had to include accompanying net force equations. A velocity vs time graph. A position vs time graph. Finally a calculation sheet that includes all calculations required to create the motion graphs. The students have been asked to turn this in before the actual launch. As we collected the data above, I never explicitly reveal how the data should be used to make these predictions, but I do give them some guiding questions that orients them. They work with their partner’s on this report, but I warn them that they will both be held responsible for understanding the process of creating the prediction report. 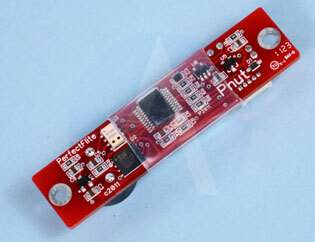 Each student rocket will be equipped with a small altimeter (from Apogee Rocketry – love this thing!). 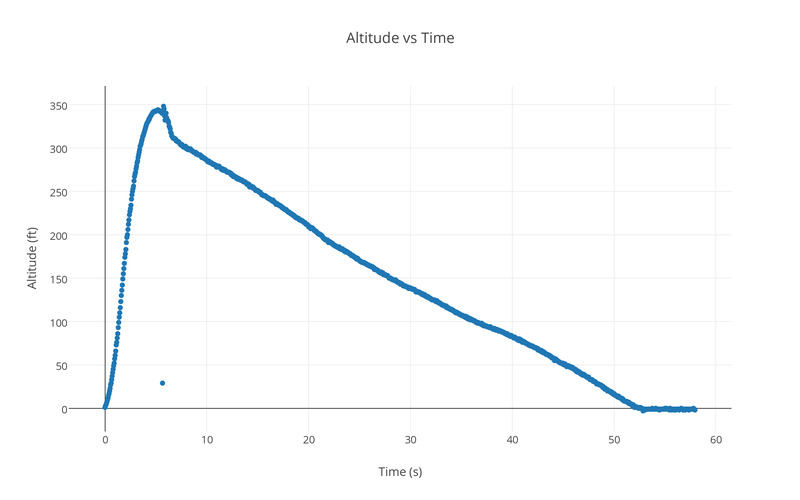 This altimeter records altitude data in 1/10 of a second intervals, and we have found it to be very accurate and reliable. We will be launching next week, so tune in soon for an exciting update on how the launches went! This entry was posted in APT Year One, Engineering Instruction, Making, News, Physics Modeling Instruction, Project Based Learning, Rocket Project, Teaching, Uncategorized and tagged Academy of Physics and Technology, Advanced Fabrication, constant acceleration particle model, Engineering, Fabrication, investigation, model rockets, net force model, Physics Modeling Instruction, Rocketry, Science Education on December 7, 2014 by Steve Temple.